The first two branches of the aorta, called the right and left coronary arteries, supply blood to the tissues of the heart. Their openings lie just beyond the aortic valve (fig. 15.12). One branch of the left coronary artery, the circumflex artery, follows the atrioventricular sulcus between the left atrium and the left ventricle. Its branches supply blood to the walls of the left atrium and the left ventricle. Another branch of the left coronary artery, the anterior interventricular artery (or left anterior descending artery), travels in the anterior interventricular sulcus, and its branches supply the walls of both ventricles. The right coronary artery passes along the atrioven-tricular sulcus between the right atrium and the right ventricle. It gives off two major branches—a posterior in terventricular artery, which travels along the posterior interventricular sulcus and supplies the walls of both ventricles, and a marginal artery, which passes along the lower border of the heart. 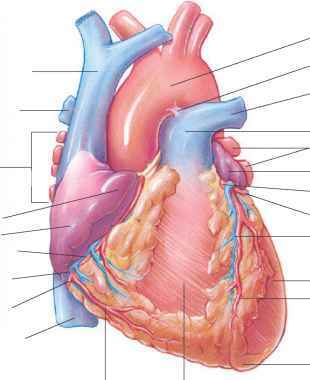 Branches of the marginal artery supply the walls of the right atrium and the right ventricle (figs. 15.12 and 15.13). Because the heart must beat continually to supply blood to the tissues, myocardial cells require a constant supply of freshly oxygenated blood. The myocardium contains many capillaries fed by branches of the coronary arteries. The smaller branches of these arteries usually have connections (anastomoses) between vessels that provide alternate pathways for blood, called collateral circulation. In most body parts, blood flow in arteries peaks during ventricular contraction. However, blood flow in the vessels of the myocardium is poorest during ventricular contraction. This is because the muscle fibers of the myocardium compress nearby vessels as they contract, interfering with blood flow. Also, the openings into the coronary arteries are partially blocked as the flaps of the aortic valve open. Conversely, during ventricular relaxation, the myocardial vessels are no longer compressed, and the orifices of the coronary arteries are not blocked by the aortic valve. 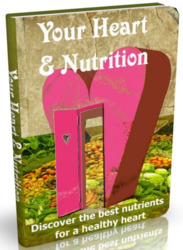 This increases blood flow into the myocardium. Blood that has passed through the capillaries of the myocardium is drained by branches of the cardiac veins, whose paths roughly parallel those of the coronary arteries. 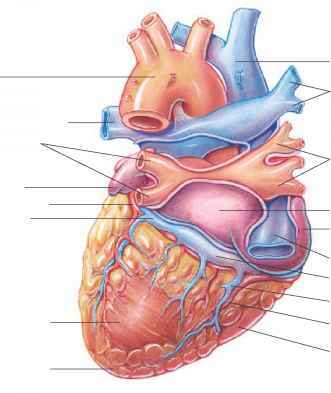 As figure 15.12fo shows, these veins join the coronary sinus, an enlarged vein on the posterior surface of the heart in the atrioventricular sulcus. The coronary sinus empties into the right atrium. Figure 15.14 summarizes the path of blood that supplies the tissues of the heart. A thrombus or embolus that blocks or narrows a coronary artery branch deprives myocardial cells of oxygen, producing ischemia and painful angina pectoris. The pain usually occurs during physical activity, when oxygen requirements exceed oxygen supply. Pain lessens with rest. Emotional disturbance may also trigger angina pectoris. Angina pectoris may cause a heavy pressure, tightening, or squeezing sensation in the chest. The pain is usually felt in the region behind the sternum or in the anterior portion of the upper thorax, but may radiate to the neck, jaw, throat, shoulder, upper limb, back, or upper abdomen. Other symptoms include profuse perspiration (diaphoresis), difficulty breathing (dyspnea), nausea, or vomiting. A blood clot that completely obstructs a coronary artery or one of its branches (coronary thrombosis) kills part of the heart. This is a myocardial infarction (MI), more commonly known as a heart attack. Blood vessels associated with the surface of the heart. (a) Anterior view. (b) Posterior view. 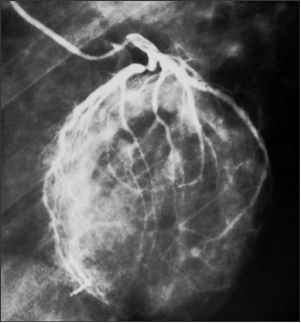 An angiogram (radiograph) of the coronary arteries is a diagnostic procedure used to examine specific blood vessels. Which structures make up the skeleton of the heart? Review the path of blood through the heart. How does blood composition differ in the right and left ventricle? Which vessels supply blood to the myocardium? How does blood return from the cardiac tissues to the right atrium? A significant percentage of cases of heart failure in adults of African descent may be due to an inherited condition called familial amyloidosis. A protein called amyloid forms deposits in the heart, causing angina (chest pain), failure of cardiac muscle function (cardiomyopathy), blockage of conduction of electrical impulses, and disturbed heart rhythm (arrhythmia). An ultrasound technique called echocardiography can detect the amyloid deposits that thicken the ventricular walls. It is important to distinguish amyloidosis from other forms of arrhythmias, because drug treatments are different. Is the pulmonary trunk in the heart an artery or vein? What vessels supplies blood to the right ventricle and left ventricle? What blood vessels supply blood myocardium? Which blood vessel supplies blood to myocardium? Which blood vessell supplies the left ventricle? Which blood vessels supply the right auricle of heart? What vessel supplies the apex of the heart with blood? What vessel provides blood flow to inferior portion of heart? What vessel supplies apex of heart location? What vessel supplies cardiac apex? 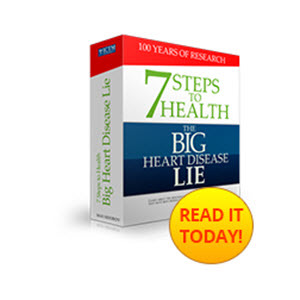 What vessels supply blood to the heart from the body? WHAT PERCENTAGE OF A HEART BEAT SOLELY SUPPLIES BLOOD TO THE HEART? What vessel supplies the apex of right ventricle? What is the name of the vessels that supply oxygenated blood to the myocardium of the heart? Which blood vessels provide the funnctional blood suppy to the heart? Is the apex of heart artery or vessel? What supplies oxygenated blood to the right atrium? Which vessel supplies blood to the left atrium and ventricle? What are the blood vessels that supply to right ventricles? Which of the following vessels supplies blood to the myocardium of the left atrium?